Areva expects a loss of €2.3 billion ($2.8 billion) on the Olkiluoto 3 project while it will only complete the plant if an agreement can be reached with buyer Teollisuuden Voima Oyj (TVO). The contract to build Olkiluoto 3 helped Areva push forward its program to expand and gain build work across the world, but in isolation it has been less successful. The turnkey project was worth €3 billion to an Areva-Siemens consortium in 2003, but a series of construction and cooperation problems have led Areva to make several financial provisions for the increasing cost. Yesterday the Paris-based company said it has put aside an extra €550 million ($782 million) and now expects a result of negative €2.3 billion ($3.2 billion) once the reactor is complete. Meanwhile, "Areva will only commence the final phases of the construction when TVO has agreed upon the proposals that have been made or issued contracts that provide for the requested modifications." These proposals and contractual modifications, it said, were due to TVO's "inappropriate behaviour in contract management" including conduct which "is not in line with standard industry practices." The reactor is now more that 80% complete with preparatory work underway for the placement of the reactor dome. Civil works on main buildings are 73% complete. Areva was also able to report 65% completion at Flamanville 3, and 30% completion at Taishan 1 and 2 in China. 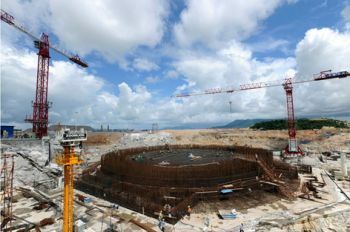 Preparations are underway for the official first concrete celebration there with partner China Guangdong Nuclear Power Company. Overall the company continues to grow in line with the nuclear industry in general. Its order book has grown by 33% since last year to some €42.9 billion ($61.0 billion). Revenue was up by 5.7% on last year to €6.5 billion ($9.2 billion) but operating income dropped sharply to only €16 million compared to €539 million for the first half last year. Net income also dropped from €761 million to €161 million. Areva confirmed that it had started a process to sell its highly profitable transmission and distribution division. It is currently seeking buyers and will make the decision to sell or not based on bids it receives. The cash money will be useful in another structural matter: the withdrawal of Siemens from the Areva NP joint venture. This leaves Areva with the responsibility to buy out Siemens' 34% share for something in the order of €2 billion ($2.8 billion). Areva said that negotiations with Siemens continue and the pair had decided to take "a bit more time to try and reach an amicable agreement." In the meantime, continuity is assured for the instrumentation and control of reactors by a new long-term partnership with Siemens.